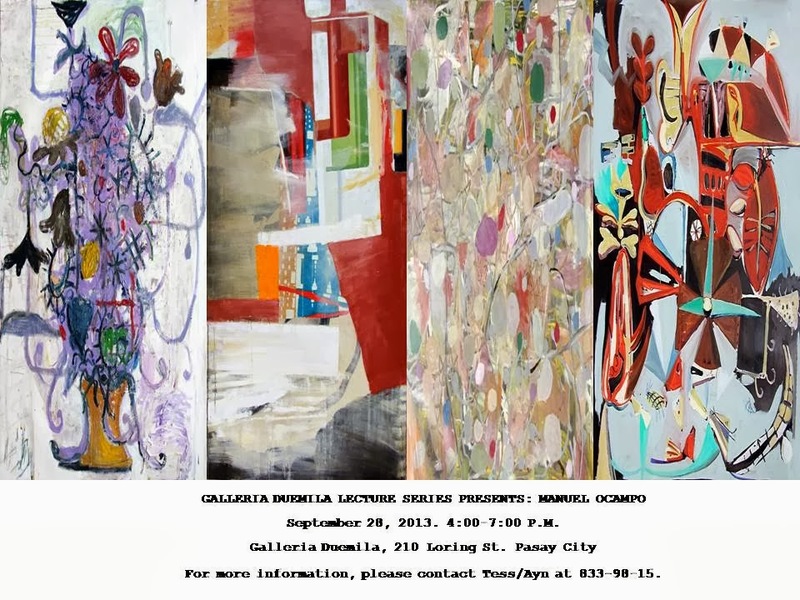 Galleria Duemila would like to invite everyone to a lecture of Manuel Ocampo entitled “DEFILE.” This will be held on September 28, 2013 at 4:00 pm to 7:00 pm at Galleria Duemila. Ocampo, who has received a number of prestigious grants and awards including the Giverny Residency (1998), the Rome prize at the American Academy (1995-96), the National Endowment for the Arts (1996), the Pollock-Krasner Foundation grant (1995), and Art Matters Inc. (1991); will talk about the composition of works in the DEFILE exhibit, its relationship to “Bastards of Misrepresentation,” and how these works and artists continually evolve and sketch a story through time and place. DEFILE exhibit is currently showing in Galleria Duemila until September 30, 2013 and feature works by Valeria Cavestany, Maria Cruz, Lizza May David, Arvin Flores, David Griggs, Manuel Ocampo, Jayson Oliveria, Juan Carlos Quintana, Carlo Ricafort, Gerardo Tan, and Timo Roter. For more information, please contact Tess/Ayn at (632) 833-9815.